Whilst enjoying our time in Bali, let’s be conscious of our impact as consumers. You will see this for sale at the airport and at grocery stores. They may seem like a cool novelty souvenir or gift, but please do not buy them. Kopi Luwak is traditionally made from coffee beans collected from wild civet poop, but now, civets are being caught from the wild to be housed in captivity so that their coffee-bean-filled poop may be harvested with ease in large quantities. 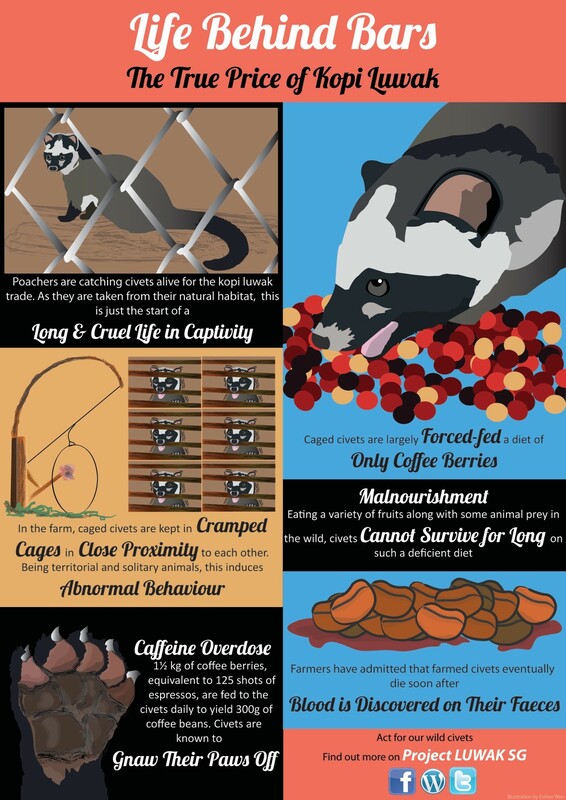 Coffee beans only make up a small fraction of a wild civet’s diet; for these captive civets, coffee beans become their diet. Bali has many civet coffee plantations that will offer free tours at their facility. You will see the wild coffee plants and caged civets, packaged with a coffee tasting session, after which, you are encouraged to buy the coffee supposedly produced from beans ingested and excreted by the civets at their plantation. You will hear different stories depending on where you go, adding to the uncertainty behind the source of these coffee beans. Please make informed choices. The illegal trade of wildlife, the fourth most serious crime in the world, has not spared Bali, from bird markets in Denpasar to bone carving villages in Tampaksiring, from pop-up stalls in Sanur to luxury souvenir shops in Ubud. Very common in Ubud, is the sale of beautiful silver-encased nautilus shells (among others), which is a protected species. Also seen in Ubud are ivory carvings from elephants, mammoths, walruses, and various other wildlife. Please be aware of this whilst we are in Ubud and during your travels around the region, and do not buy any of these wildlife products. Supply and demand go hand in hand, so let’s be responsible travelers! 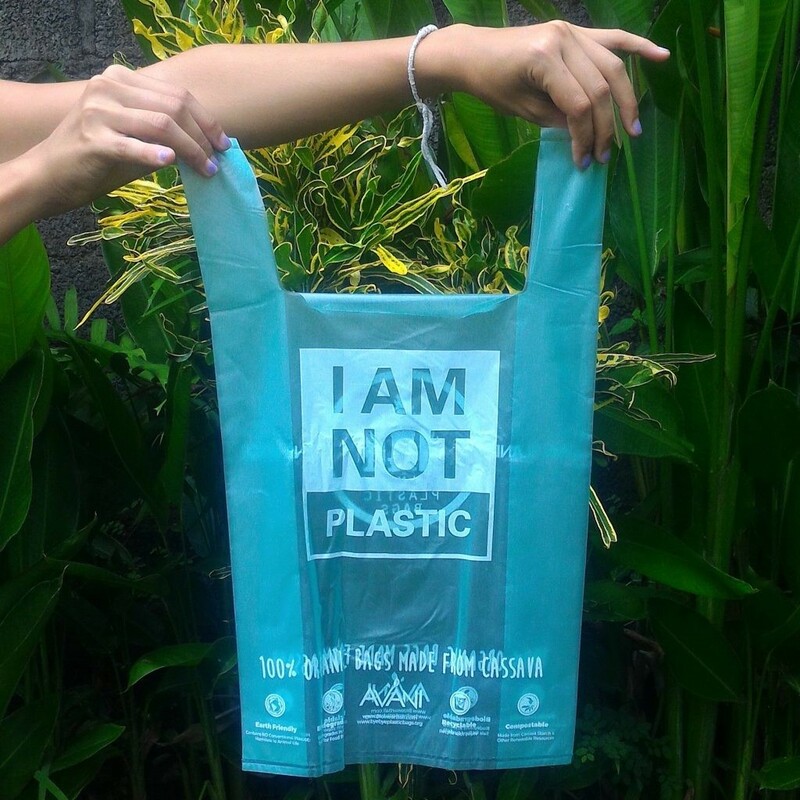 In December 2018, Bali enacted a ban on single-use plastics such as shopping bags, styrofoam and straws (hurray! ), with the aim to reduce marine plastics in Bali by 70% within the year. Please help to achieve this by bringing your own reuseable water bottles, straws and bags, so that you can say no to single-use plastics. Avani Eco, a Bali-based company converts cassava, which is abundantly available in Indonesia, into plastic bags and straws, and turns sugar cane fiber into takeaway containers. Their most distinctive item is the "I'm Not Plastic" cassava bags, which are biodegradable, compostable and awesome, so these, you may say yes to.